You spend all year waiting for the weather to be nice. Why not create an outdoor oasis so you that when it warms up, you can enjoy gaming, streaming music, and your favorite films while still basking in the sun (or the shade of your covered patio) of your Charlotte area home? Having your AV and media setup in your backyard lets you bring your favorite entertainment to the great outdoors...of your home. Your backyard is a haven for relaxation – why not get the most out of it by creating a setup that allows you to use it all spring, summer and fall? Our outdoor AV solutions keep your backyard’s aesthetic while still letting you watch concerts, movies, sporting events and more while basking in the sun. 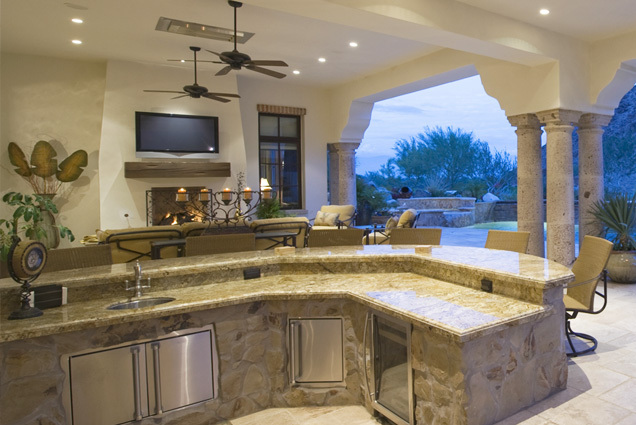 Home Theater Solutions has installed many unique outdoor AV systems. We’ve got the history and experience needed to ensure you’ve got the right outdoor AV products installed the right way. Contact Us to setup your free consultation today.